I've got very small earholes. Ear canals. And while you might think that's not too much of a distressing affliction, if you've ever tried to find earphones to fit into teeny earholes you'll appreciate my woe. I'm not a fan of those earphones that rest in the cuppy bit of your ear. It all feels a bit perilous and I can't keep those in at the best of times, never mind when I'm running (shockingly my new favourite pastime!) so while I love my iPhone the earphones that come with it don't get much love from me. I've tried a few other makes and models and even with the smallest size earpieces these in-the-canal earphones work their way out at the slightest hint of movement. 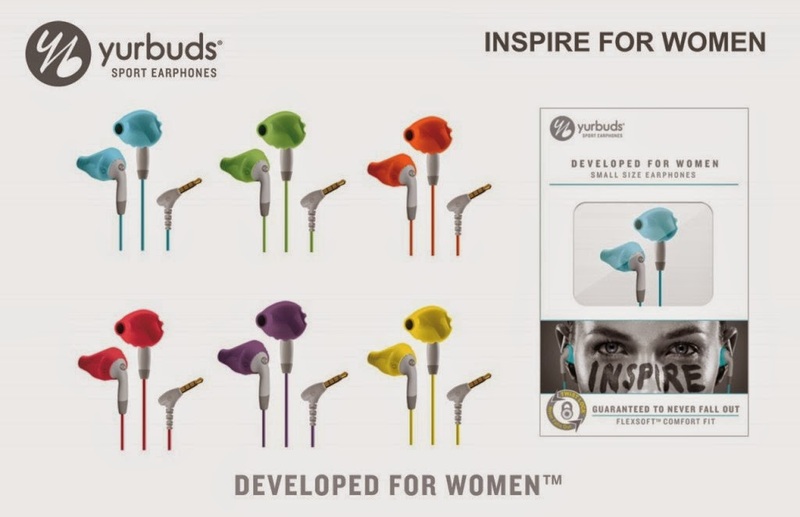 While perusing some running forums I saw some recommendations for the Yurbuds Inspire for Women. I picked up the pink pair (from Amazon for £21.25) to match my new Nike Trainers. These earphones are designed especially for smaller ears and have a clever way of fitting, with a short tube that goes slightly into the ear canal with an outer section that fits in the part just outside the canal. You pop the tube section into your ear with the cable section pointing downwards and a little to the back. You then rotate the earphone forwards until the cable sits slightly forwards in a conventional fashion. This locks them in place. The Inspire for Women comes with two sizes of earpiece (4 and 5) and I used the smaller of the two. Yurbuds are guaranteed to 'never hurt or fall out' and they are definitely comfy. I forgot I was wearing them after just a couple of minutes and there was absolutely no sign of them becoming dislodged throughout my run. I'm also really glad they are water/sweat proof as even at this time of year rain is a definite danger at any given moment! I found them to be great sound wise. A nice depth of tone for my playlists and I also liked they they allow some degree of ambient noise to still be heard. Many earphones are understandably designed to cut out these background sounds, but where running is concerned I'd rather be able to hear cars etc coming thanks very much! The model I chose doesn't have any volume or phone controls and I do wonder if I should have gone for the next model up, if only so I can skip tracks that I'm not loving during my runs, but if having to create a more fine-tuned playlist is the only downside to these earphones then I can make my peace with them!